Strip title: "Astérix le Gaulois"
First format: Strip on French weekly comic magazine "Pilote"
Background: «We are in 50 BC. All Gaul is occupied by the Romans. All? No! Because a village populated by irreducible Gauls still resists the invader. And life is not easy for the garrisons of Roman legionaries of the entrenched camps of Babaorum, Aquarium, Laudanum and Petibonum...» (from the map of Gaul legend opening the Astérix volumes). This Gallic village resists the invader thanks to a magic potion prepared by the druid Panoramix (eng. Getafix), which temporarily gives superhuman strength to who drinks. --- Astérix (eng. 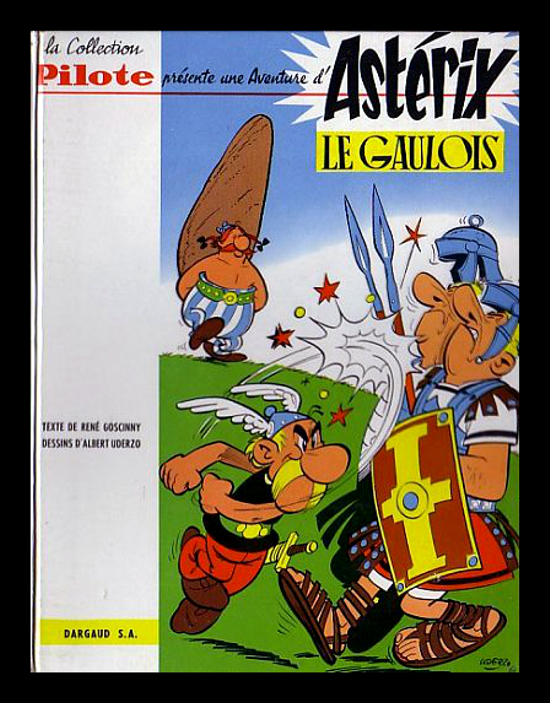 Asterix), first appearance in the story "Astérix le Gaulois", Pilote magazine No. 1, October 29, 1959. Astérix is the titular hero of the series, a generously-mustachioed Gaul warrior born in 85 BC. Small and thin, frail, Asterix is physically far from the stereotypes of the comics hero. Its distinctive dress consists of a black top, red trousers, a sword worn on the side and a helmet adorned with two pens that, according to their direction, reveal his mood. His name derived from "astérisque", meaning "asterisk", from the Greek word meaning "star", as the star of the series. --- Obélix (eng. Obelix), first appearance (along with Astérix) in the story "Astérix le Gaulois", Pilote magazine No. 1, October 29, 1959. Obélix is Asterix's closest friend and works as a menhir sculptor and delivery man. He is a tall, obese and ravenous, with a phenomenal strength acquired when he fell into Panoramix's magic potion cauldron as a boy. He wears trousers vertical white and blue stripes, stripped to the waist. His name derived from "obelisk", a massive monument, or the typographical symbol sometimes used to indicate a second footnote if the first footnote is indicated by an asterisk. --- Jules César (eng. 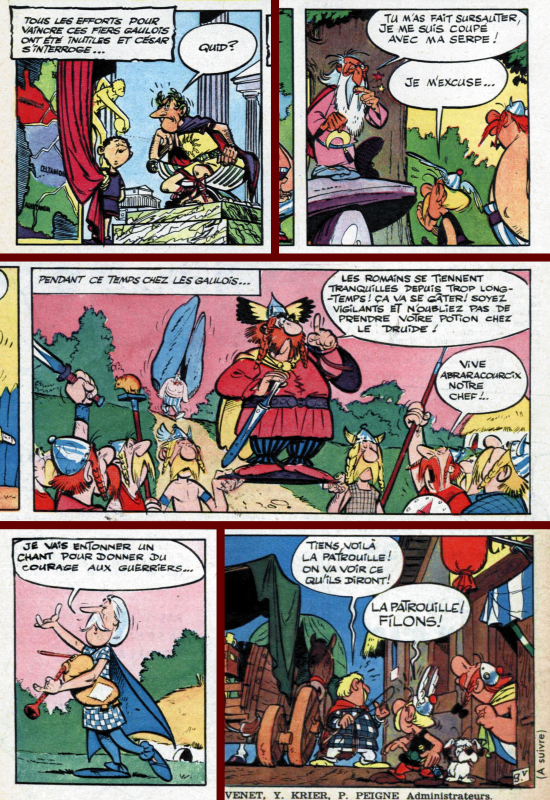 Julius Caesar), first appearance (as well as Astérix and Obélix) in the story "Astérix le Gaulois", Pilote magazine No. 1, October 29, 1959. The character of Julius Caesar is a consistent but satirical representation of the historical figure of the same name former Roman consul, conqueror of Gaul. --- Panoramix (eng. Getafix), first appearance in the story "Astérix le Gaulois", Pilote magazine No. 3, November 12, 1959. Panoramix is the village druid: tall with a white beard, he is the only one to possess the recipe of the magic potion. --- Abraracourcix (eng. 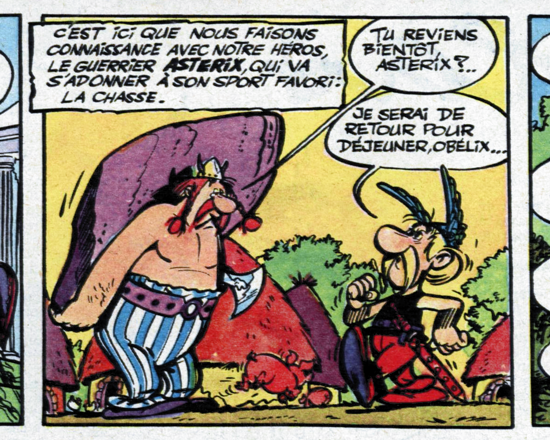 Vitalstatistix), first appearance in the story "Astérix le Gaulois", Pilote No. 6, December 3, 1959. Abraracourcix is the chief of the "village des fous" (fools' village). He is a middle-aged, bigbellied man with red hair, pigtails and a huge moustache. --- Assurancetourix (eng. Cacofonix), first appearance in the story "Astérix le Gaulois", Pilote No. 6, December 3, 1959. Assurancetourix is the village bard. He loves singing and playing musical instruments like lyre, bagpipes, drum and a Celtic trumpet... but his performances are unbearable. --- Idéfix (eng. 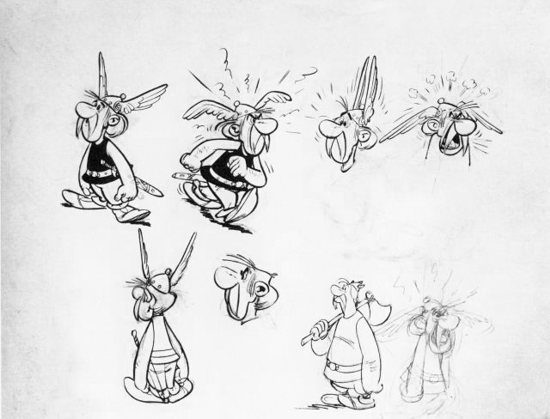 Dogmatix), first appearance in the story "Le Tour de Gaule d'Astérix", Pilote magazine No. 179, March 28, 1963. Idéfix is Obelix's pet dog, a small white dog of unknown breed, accidentally met for the first time in this story. Features: The duo René Goscinny (author) - Albert Uderzo (illustrator) formed in the early 1950s and quickly led many projects together. In 1959, the advertiser François Clauteaux decided to create a new magazine for children, funded by Radio Luxembourg and titled "Pilote". There were only three months until the trial edition of Pilote was due out, and the two authors were really under pressure: they had to create a completely original comic strip series based on French culture. Finally, they decided on the period of the Gauls. Within a few hours, they created the Gallic village and its inhabitants. René Goscinny imagines a wily character in the small form, taking the opposite of the usual comics hero; Uderzo adds a strong but dim companion to which Goscinny agreed. Astérix and Obélix are born. 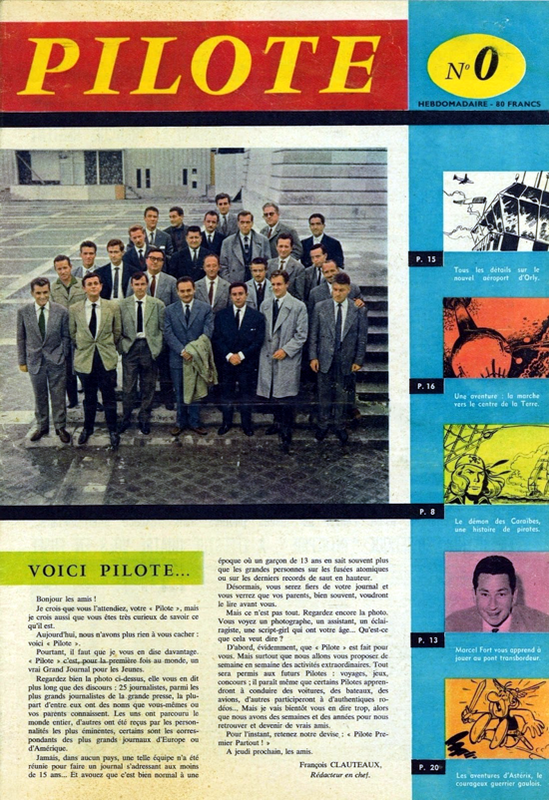 In early October 1959, the strip was tested in the teaser issue Pilote No. 0, around 200 copies printed. Astérix and Obélix made their first official appearance on October 29, 1959 in Pilote No. 1: around 300,000 copies, immediately sold out. The first story, "Astérix le Gaulois", was published weekly in Pilote magazine from No. 1 until No. 38 (July 14, 1960), with a rate of one/two pages per week. In 1961, the entire story was collected in the volume "Astérix le Gaulois", first of a series titled "Collection Pilote", by editor Dargaud. 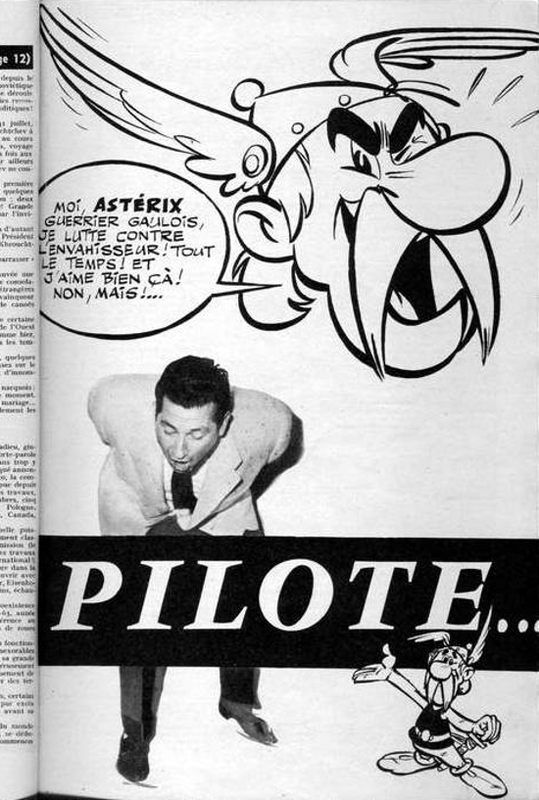 Interesting facts: The launch of Pilote magazine was a success, as well as the adventures of Astérix; despite this, in 1960 the financial backing for the magazine ceased, and Pilote was taken over by publisher Georges Dargaud, for a symbolic franc. 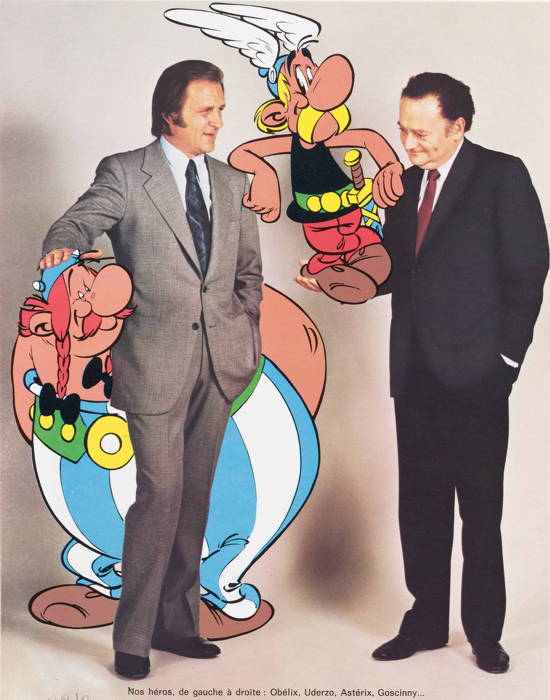 When Goscinny died in 1977, Uderzo continued the series alone, until September 2011, when he retired from drawing. Introduction (translated from the first strip): «Astérix mischievously embodies all the virtues of 'our ancestors the Gauls'. The humor of René Goscinny and Uderzo will make you love this little mustached warrior, new character in comics». 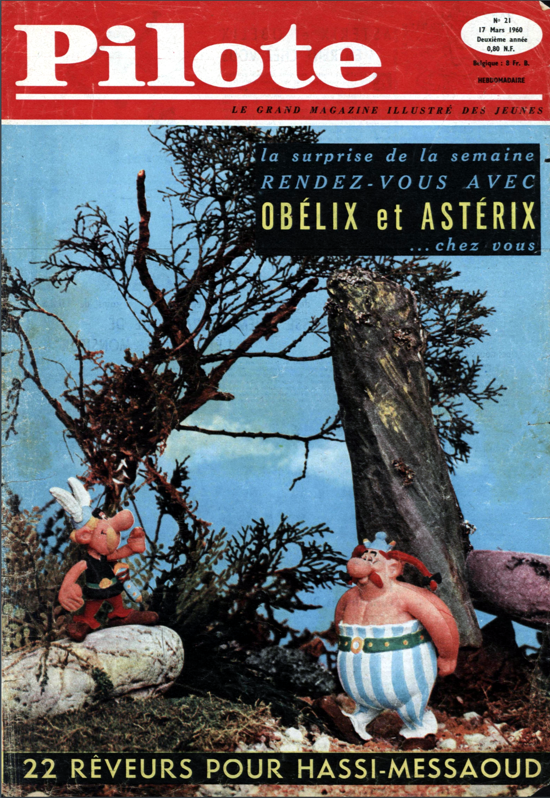 Astérix, first print advertising (1959). The Radio Télé Luxembourg Almanach announces the imminent arrival of Pilote, a weekly comic magazine that covers the adventures of Astérix. Astérix le Gaulois, the first strip was tested in Pilote magazine No. 0 (early October 1959, around 200 copies). 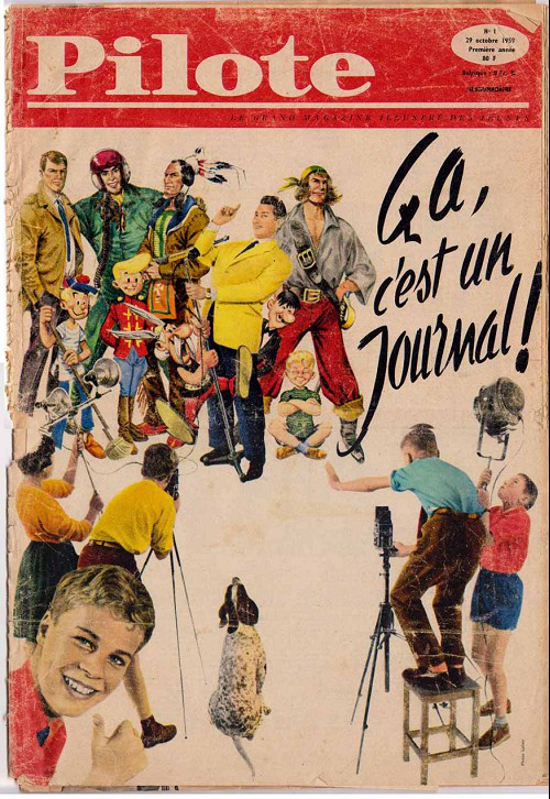 Apart from a reference to the Astérix strip (bottom right), the cover shows a photo of a large group of collaborators, but most were just friends of the authors, in front row: writer René Goscinny (4th from left, with jacket in hand) and illustrator Albert Uderzo (6th). 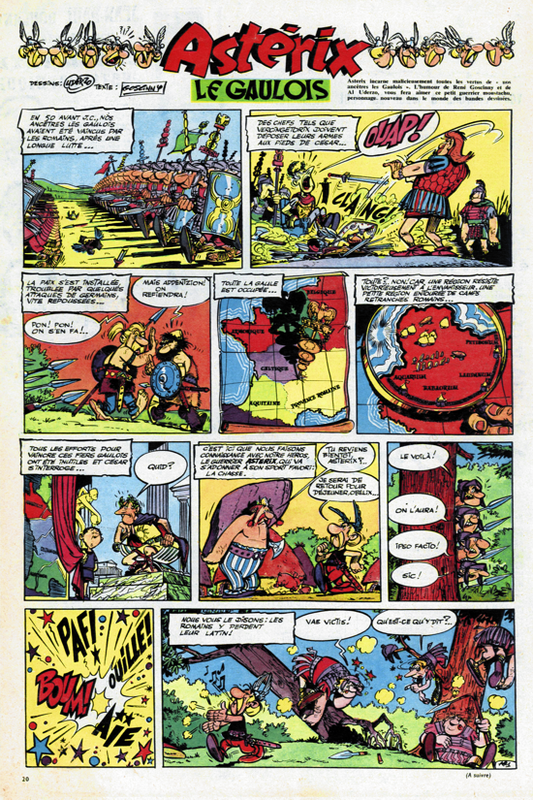 Astérix le Gaulois, the first strip made its debut in Pilote magazine No. 1 (October 29, 1959, around 300,000 copies, immediately sold out). Astérix le Gaulois, the first strip (October 29, 1959). Promoted through Pilote magazine No. 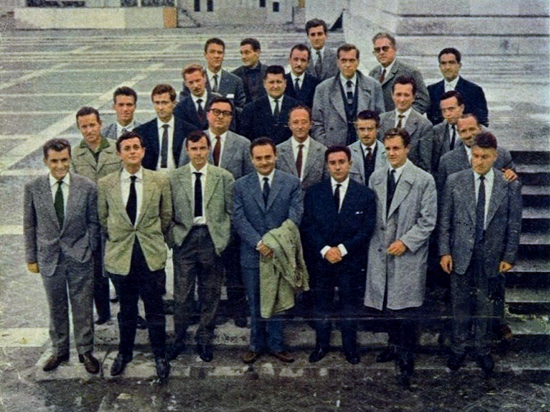 0 in early October 1959, the first story was launched as serial in Pilote No. 1. 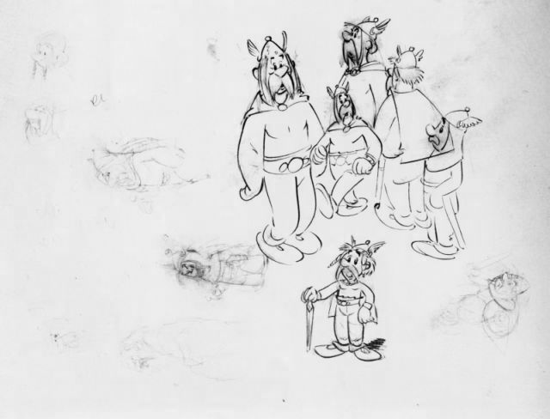 Astérix, characters in their first appearances. Jules César (Julius Caesar), Panoramix (Getafix the druid), Abraracourcix (Vitalstatistix the chief), Assurancetourix (Cacofonix the bard), and Idéfix (Dogmatix the dog). Astérix le Gaulois, first volume (Dargaud, 1961). This volume collects the first story distributed weekly in Pilote magazine from No. 1 (October 29, 1959) until No. 38 (July 14, 1960). The creators of Astérix comics. Left: Alberto Aleandro Uderzo (Fismes, April 25, 1927), comic book artist and scriptwriter. Right: René Goscinny (Paris, Aug. 14, 1926 - Nov. 5, 1977), comics editor and writer. Astérix comics, the 50th anniversary (1959-2009). 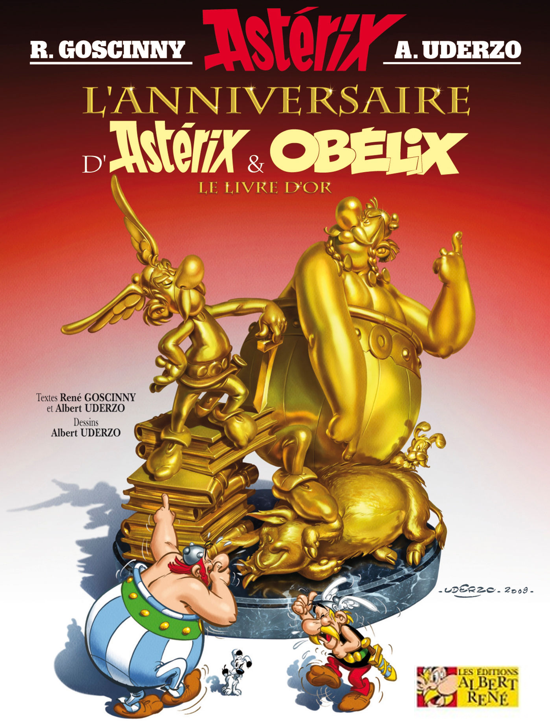 The 34th volume of the book series, released by Les Éditions Albert René on October 22, 2009, celebrates the first strip with a collection of short stories, all linked by the theme of Astérix's anniversary. Designed and written by Albert Uderzo, "L’Anniversaire d’Astérix et Obélix" also includes stories which were created jointly with René Goscinny.